In a non-stick skillet over medium heat, add a tablespoon of extra virgin olive oil. Whisk eggs together until combined and frothy, season with kosher salt and fresh cracked pepper. Add eggs to pan, waiting to stir until eggs have set. Using a wooden spoon, gently lift the cooked portions from the bottom of the pan, allowing the runny portions to reach the heat. Continue in this manner until no more runny portion remains, careful not to over-scramble. Meanwhile, heat the leftover steak to temperature using a microwave or skillet over medium heat. 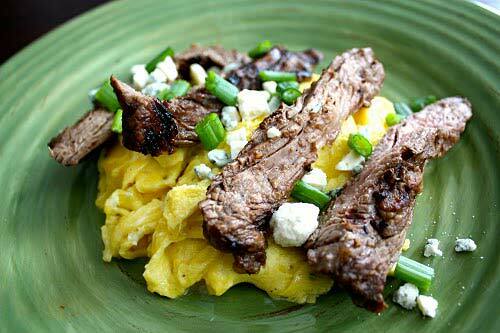 Plate eggs, topped with sliced steak, and garnish with diced spring onion and crumbled blue cheese. Serve.